Portugal’s Atlantic Coast is renowned for its abundance of fish and seafood, and the best place to sample it is in the coastal fishing villages. 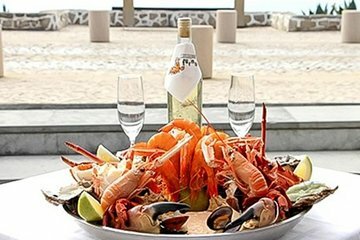 On this tour, visit either Sesimbra or Ericeira village, tuck into a delicious seafood lunch at an atmospheric beachside restaurant, then enjoy free time to explore the sights and watch the fishing boats. Our guide, David, took us on a beautiful day trip to the palace and monestary at Mafra, to a fabulous lunch at Ericeira. We were treated like VIPs, and even met this beautiful restaurant’s owner, Carlos. Riding along the seaside back to Lisbon was pure beauty. This tour is expensive, but worth every Euro. David provided very informative and intelligent commentary, answering our questions, and educating us about the colorful history of this beautiful country. We were a party of 4 and we were picked up at our hotel. Our guide Hugo was amazing. He was calm, cool and had the most amazing sense of humor. Our first stop was at a beautiful palace which he allowed us to tour without rushing. We then drove through a seaside village on our way to the restaurant for the most delicious SEAFOOD FEAST!!! Again, Hugo did not rush us, we ate leisurely then walked along the rocks and took loads of pictures. From there Hugo took us to his special place which was an amazing neighborhood, high in the rocks overlooking the ocean. On our way back to the hotel, Hugo took us along the scenic route and even showed us another palace as we passed. This tour is a must do and if possible, ask for Hugo as your tour guide. He is the absolute best.